Switchtek™ PFA Optic Leak Detector | U.S. Plastic Corp. The general purpose optic switch is a great choice for leak detection in and around secondary containment sumps, tanks and pipes. The sensor can be applied in a broad range of chemical solutions. It has no moving parts and works on the principle of light reflection. If liquid comes into contact with the clear angled window on the end of the sensor the light will be absorbed into the liquid instead of being reflected back to the transmitter. Media examples include chlorine, deionized water and chromic acid. The sensor is submersible and can be mounted within the interstitial space of a double containment vessel, laid in the bottom of a containment basin, or threaded into a 3/4‚Äù NPT fitting installed in the side of a tank. 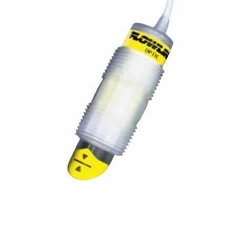 Powered by 24 VDC, these fail-safe sensors can be wired as a normally open or normally closed contact and will invert to ‚Äúwet‚Äù to alert the user for proactive maintenance. Orientation: universal. Accuracy: ± 1mm in water. Repeatability: ± 0.5mm in water. Supply voltage: 12-35 VDC. Consumption: 25 mA maximum. Contact type: (1) SPST relay. Contact rating: 60 VA. Contact output: NO/NC. Process temperature: -40°F to 176°F. Pressure: 150 psi @ 25°C, derated @ 1.667 psi per C° above 25°C. Sensor rating: NEMA 6(IP68). Cable type: 4-conductor, #22 AWG (shielded). Cable length: 10'. Mounting gasket: Viton™. Classification: general purpose. CE compliance: EN 61326 EMC & EN 61010-1 safety.